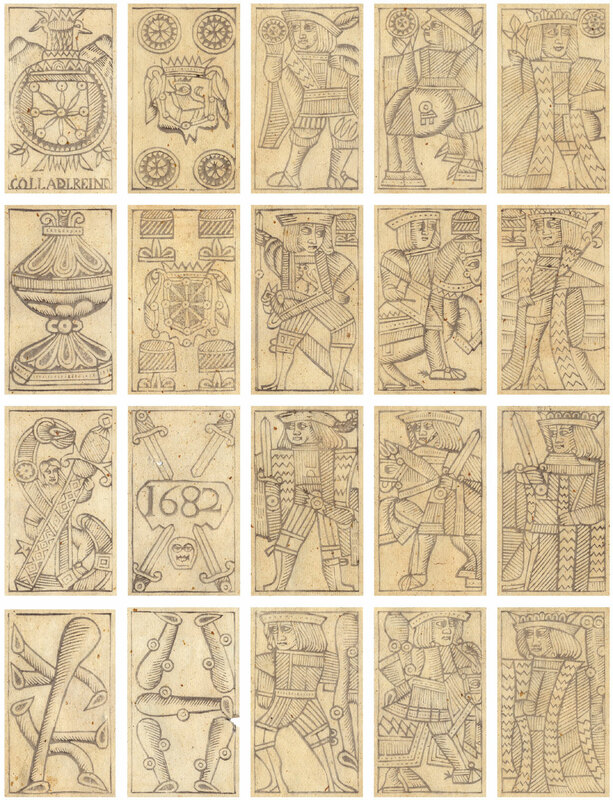 Playing cards produced for the Pamplona General Hospital Monopoly in 1682 representing the archaic ‘Navarra Pattern’, for use in the kingdom of Navarra. The designs became established as a regional pattern as the monopoly contract was renewed over time. Thus, cards could be differentiated from those of neighbouring kingdoms or tax jurisdictions. It is likely that wooblocks, and even completed packs of cards, were produced in France for the Pamplona General Hospital since 1631, which explains why the designs contain features common to earlier or archaic French cards. Above: the ace of coins features the coat of arms of Navarra with a double-headed eagle and the inscription CON L(A) L(ICENCI)A DEL REINO. Above: cards from 4 separate proof sheets comprising a full pack of 48 cards produced for the Pamplona General Hospital Monopoly in 1682. Each card measures 50 x 84 mm. The sheets were discovered inside the binding of an old book, having presumably been rejected during manufacture and re-used as stiffening for the book covers. The watermark in the paper features the coat of arms of Amsterdam, which was used in France and Holland for products destined for exportation during the period 1635-1796. 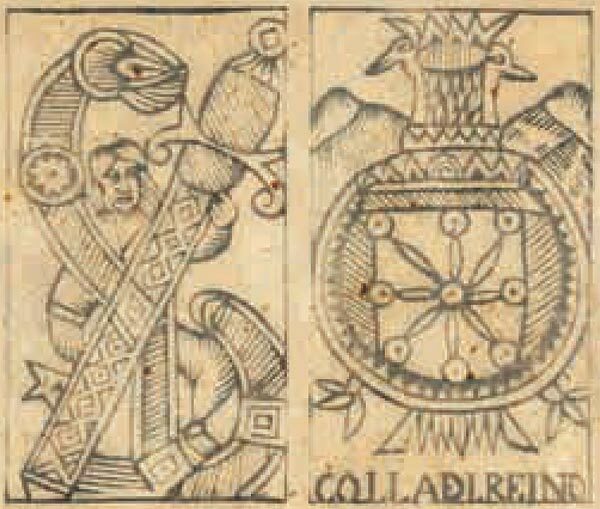 The cards do not have the ‘pintas’ (border breaks) usually found in Spanish playing cards after c.1600, which lends support to the argument for a French origin of the woodblocks. Ferro Torrelles, Víctor: Unos Naipes para el Reino de Navarra, in “La Sota” Nº44, Asescoin, Madrid.